You can ride your bike through the solar system in Wisconsin this summer. Call it a combination of outdoor recreation and science education. Jim Lattis, director of UW-Madison&apos;s Space Place, says Planet Trek utilizes the Dane County trials system to represent eleven major objects in the solar system, at a scale of 1-to-200-million. "The smallest object we represent, which is the largest of the asteroids, now called the dwarf planet Ceres, is only the size of a peppercorn," explains Lattis. "At that scale though, we had to put Pluto in Mount Horeb, about twenty three and a half miles from the Sun, which we located at Monona Terrace." Lattis says that sort of scale gives a much more realistic sense of the solar system than anything on the printed page. "It begins to dawn on you how vast the space is, and in what sort of huge regions of space those lonely planets are orbiting out there," he says. 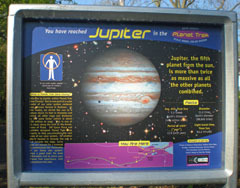 There&apos;s a Planet Trek event on June 20th, with guided tours of the inner planets, not too far from the Sun at Monona Terrace, or for the adventurous, all the way out to Pluto in Mount Horeb. "One of the things that we thought would be interesting about this project is that it&apos;s sort of a combination of science outreach with outdoor recreation," Lattis says. "A way to make a recreational, physical activity have a science education component to it." And not just as astronomy, as the taking the tral all the way to Mount Horeb will take Planet Trekkers past lakes and wetlands as well.